It was late February of this year when Cole Taustin, Jay Taustin and Frank Raffo initially closed the deal on West Ocean City’s newest restaurant. 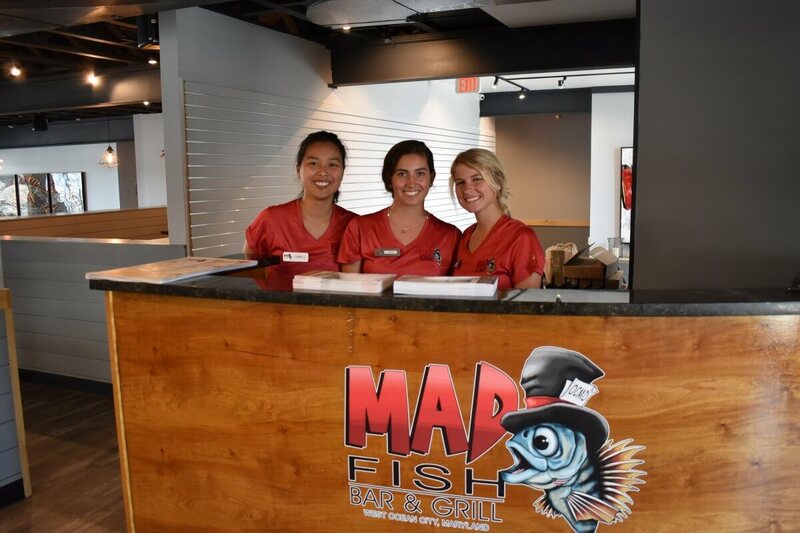 It was then almost instantly that construction crews came to the scene, appropriate licenses were garnered and in what might be the quickest restaurant turnover in Ocean City history, the old Ocean City Fish Company was transformed into Mad Fish Bar & Grill in just 10 short weeks. “I’m not crazy, my reality is just different from yours,” says the fish on the wall. The new restaurant’s owners are building upon the success of The Embers Restaurant and Blu Crab House & Raw Bar, two of their businesses which happen to be located side-by-side in downtown OC. That’s the scariest part of this new venture, Cole Taustin said: opening a new location that’s literally in a new location. 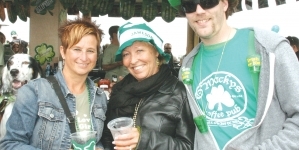 “We’re new to West Ocean City, but we’re new to the whole area in the fact that what we’re providing is something unlike anything else in town,” he said. 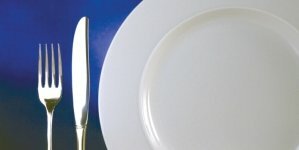 The downside of their new location is the daily trips the restaurant’s owners now have to make between West OC and over the bridge to downtown. It’s a minor setback compared to what most new businesses face — but then again, Ocean City’s summertime traffic can be pretty killer. They don’t see themselves as being in direct competition with other West OC businesses, Taustin said. 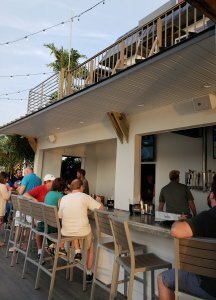 Instead, they’re targeting a “different niche,” and are adding new dining elements to the Ocean City restaurant scene rather than taking away from anyone else’s. 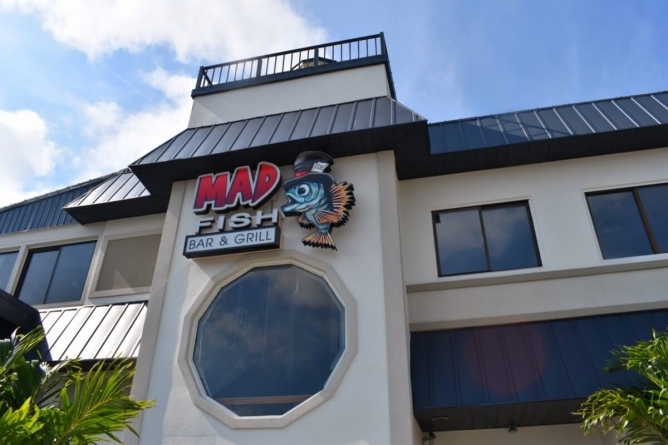 Theme-wise, there’s nowhere in Ocean City that’s quite like Mad Fish. For their quirky name-and-logo combination, Taustin and co-owner Frank Raffo were simply tossing names back and forth and mocking up images online before they decided they needed the word “fish” in their branding. They made their lists of potential fish-name ideas, and finally converged on Mad Fish, which for Raffo was inspired by his kids and Dr. Suess, and for Taustin evoked Mad Hatter/Alice in Wonderland vibes. 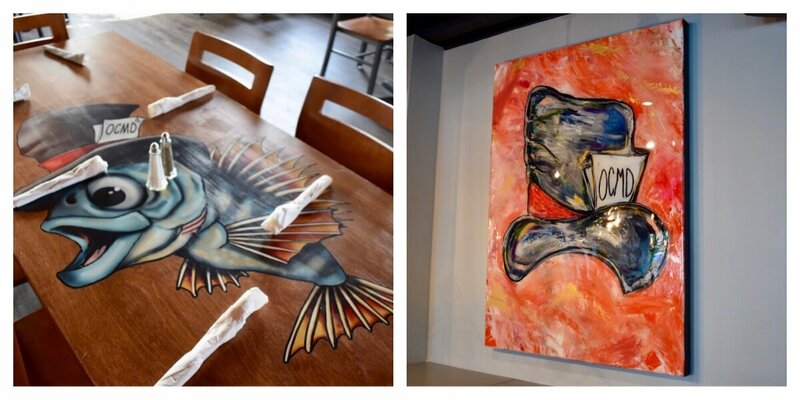 Inside Mad Fish, local collabs: Table designs were printed by Ocean City print shop Plak That, and the beautiful glittering wall art was made by local artist Abbi Custis. 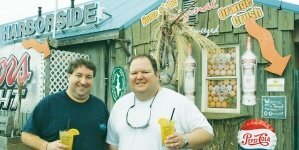 Even two of the restaurant’s bars were built by Jason Hearn of Tall Tales Brewing Company. The theme and the aesthetic of the restaurant is a welcome change of pace in West O, not that there’s anything wrong with the decades-old dives and restaurants on the bay that are tried-and-true for their sunset views, their signature crushes and, what else, their fresh seafood selections. 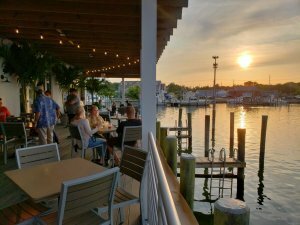 Mad Fish docks another boat in the harbor to ride the rising tide of a local dining scene that only gets better with age. Their doors are open to any local or tourist looking to have a good time. View from the outdoor seating area, taken during one of the restaurant’s soft openings. The menu is new, but much of it adds on to selections that have already proven to be successful at Blu Crab House. 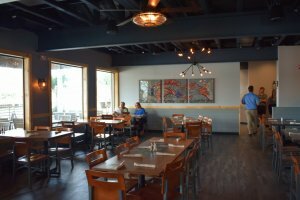 Like Blu, they’ll serve halibut, tuna, crabcakes and crab dip, and they’ll also feature a Fish of the Day, synonymous with the restaurant’s name. There’s a full raw bar, steamer pots and “great ceviche,” Taustin said, and Executive Chef John Latta has been experimenting with different land options as well: Chili nachos, slow-cooked ribs and filet mignon plates are all on the menu. At the bar, of which there are three throughout the restaurant, diners will find classic crushes, margaritas, Moscow mules, Tall Tales and other craft beers on tap and creative specialty drinks including the MF’in Punch and the Mad Tai, a variation of the classic Mai Tai. Rather than throwing their new staff right into the lion’s den, the restaurant has conducted a number of soft openings to give chefs a chance to familiarize themselves with the menu, bartenders practice with their specialty drink-making muscle memory and servers the opportunity to get to know the place’s layout and its POS system. The grand opening and ribbon cutting, open to the public, will take place on Friday, June 15 at 4 p.m. The response at the soft openings has been phenomenal, Taustin said. 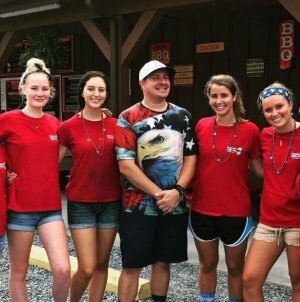 He has his staff to thank for getting Mad Fish off the ground, from their general contractor through the building process to their in-house culinary team, managers and waitstaff. A good restaurant can’t exist without a good team.